Delivering crisp HD sound, the Ribbons by KitSound are powerful earphones that provide punchy bass with sweet middle and high notes. 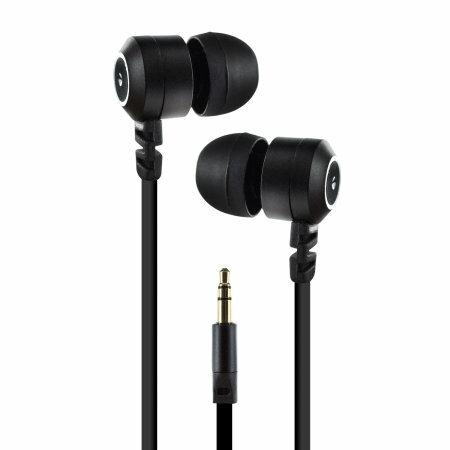 Featuring a flat anti-tangle cable and a sturdy, stylish black design which, provides a premium feel. The sound is thin and tinny . If you want a budget earphone then they are OK at £1.99. Wanted something with better audio quality than the little white ones you get at the corner store, but that didn't squeeze my head like my big noise-isolating ones. Was nervous these would be poor quality due to the price; but they're great. They blow away the little cheap ones; and I've only had them a month, but it seems like the cord is a lot more durable. Great sound quality, great headphones! Bought a pair of these recently and was way above my expectations, great audio quality and the anti-tangle cable is a neat feature.